Mark your winter themed occasion in style with these snowman bookmarks from our Snowman Sentiments Collection. Simply irresistible and a true symbol of winter’s delight, everyone loves a snowman! So add a delightful addition to your guests’ winter reading with these cheery snowman bookmarks. Each measures 7.5cm x 2cm and features a personality-packed snowman charm made of snow white poly resin detailed with painted blue features and glistening clear rhinestone accents, attached to a white metal bookmark clip. 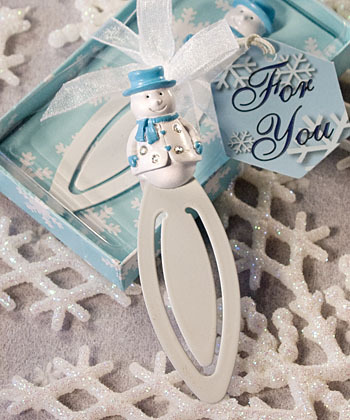 Each snowman bookmark comes attractively packaged in a Snowman Sentiments Collection signature box with a winter blue/snowflake design base and clear top, tied with a white organza bow and an attached snowflake design ‘For You’ tag.